A sad movie, this film is quiet and low key without a whole lot happening, and yet still manages to hold our attention and keep us involved. Revolutionary Road is a movie about a young couple in new york during the forties. the man works in the city and the woman tends to the children at home. problems start when the two of them begin to dream bigger and plan to move to paris. there are multiple affairs and one-night stands here, and we end up with two unhappy people living in the suburbs. the movie isn’t all that eventful or unique, but it does hold our attention the whole way through by using quiet, artistic touches. michael shannon deserves a lot of credit for playing the most interesting character in the film, a crazy person who seems to understand the couple’s dreams, more than anyone else they come across. the movie is better than expected, considering that there isn’t too much on screen here that we haven’t seen before. 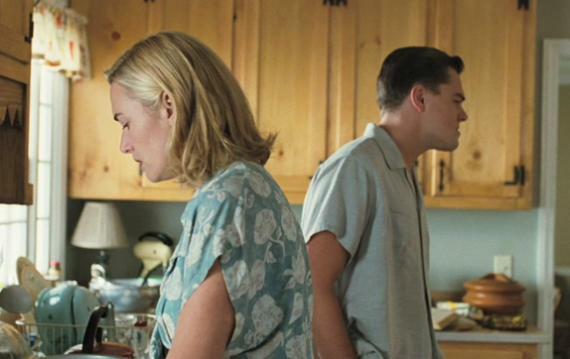 Revolutionary Road is an interesting drama about married life in the suburbs. it’s about two people who get together in the city and move out to a place where they can buy a nice big house and enjoy neighborhood life. only that’s when the problems begin. the movie doesn’t have a whole big agenda, and maybe that’s part of the appeal. it feels very realistic and deals with depression and disappointment without ever making too much conflict. we meet frank (leonardo dicaprio) and april wheeler (kate winslet) when they see each other at a party for the first time. he charms her with his humor, and they fall for each other. frank is a machines salesman working out of an office in new york. april has no immediate desires and is content to be a housewife. so the two of them get married and move to the suburbs. we meet two sets of their neighbors. there’s kathy bates playing mrs. givings, the realator who also lives on the street. she and her husband have a son who was recently locked up in a mental asylum. mrs. givings tells frank and april that her son would like to meet them, just to have some kind of contact and social interaction with people his own age. april agrees. the other couple we meet are frank and april’s best friends. this is milly and shep campbell, who live just a few houses away. early on we see frank and april go over to their place for a barbecue. everything seems pretty normal in frank and april’s lives, except for one thing going on at the office. frank has a one-night stand with his secretary. it’s his birthday and he manipulates her into drinking a lot and then going to a hotel room with him. that’s really the only thing that happens in the first section of the film. that and a play which april is in, that is recieved terribly by the audience. frank and april get into a big fight in the car, following the play, over april wanting to forget about it and frank not being able to let the topic go. that and the affair pretty much round out the first half of the movie. then frank and april get the idea to move to paris. it’s a spark that ignites simply because neither one of them wants to say no. they tell all of their friends and nobody can believe it. the whole thing seems unrealistic and childish to everyone around them, but frank and april don’t care. she knows that he’s unahppy at work and doing a job that he can’t stand, and this seems to be his way out. the problem is that at the same time that they plan to make their getaway, frank’s company offers him a huge promotion. perhaps the higher ups in the company heard from one of the coworkers frank told, that he had plans to relocate. with that information, maybe they decided to make him an offer before he even brought the move to their attention. frank and april stick to their guns about the move for quite a while. at one point frank even goes out with his boss and tells him. but at last they make a decision and it is one that leads to a great deal of depression. suddenly frank isn’t the only one having an affair. part of the reason against the move is april’s pregnant condition. the two of them already have two kids, and april doesnot want another. one day she shows frank some rubber tubing she picked up, with plans to give herself an abortion. as if frank and april don’t have enough on their plate, with being torn between whether or not to move and also whether or not to have this third child, in comes their neighbor’s son. this is john givings, played by michael shannon in one of the actor’s breakout roles. john is a dreamer, just like frank and sally. when they plan to go to paris, he completely understands and seems to be the only person in the world who doesn’t think they are crazy. when they have second thoughts, john can’t handle it. john is the most interesting character in the movie. that’s mainly because most things happening in the story here we’ve seen before in other films and shows. the crazy neighbor who ends up being on the same page with the couple’s dreams, is a unique element. there’s a lot to like about this movie, which somehow manages to hold our attention the whole way through. while it is interesting, one can’t help but notice that very often (especially in the first half), there isn’t a whole lot going on. on the one hand it’s a realistic portrayal of married life in the suburbs, but on the other hand, we go to the movies to see something more. the second half of the movie definitely picks up and gives both of our main characters some secrets. when frank’s secret comes out, he is shocked by april’s reaction. if only the first half of the movie had this kind of momentum, it would have been a better film. still, the movie deserves credit for doing so much with so little and getting more and more compelling as it goes on.